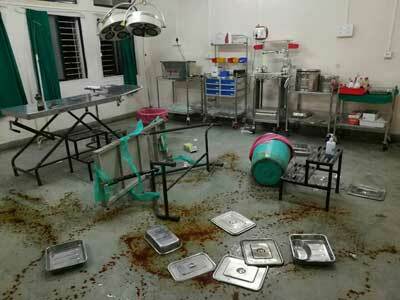 The entire incident has been caught on the CCTV of the hospital, and the Video footage of a doctor being brutally assaulted with rods, hands among other things went viral on social media last night. The incident happened last night, when a patient was brought to the emergency of the hospital, with a head injury. 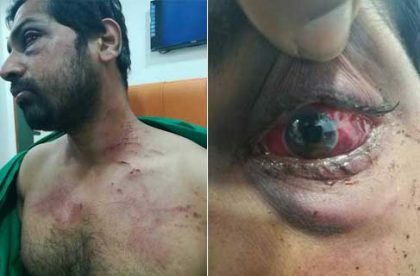 The resident doctor, Dr. Rohan Mamunkar, tended to the patient in emergency, but asked the family to take the patient to a higher centre as the hospital did not have a neursurgeon available on duty. This advice of the doctor did not go well with the mob of around 20-39 attendants of the patient, who attacked the doctor, turning him black and blue. It is reported that he has now been admitted to the same hospital with injuries on his abdomen, chest and head, a fracture on his orbital bone and has lost vision in one eye. The police authorities informed that nine identified persons have been arrested and that an FIR has been registered against the accused, who can be seen beating up the doctor, under relevant sections of the IPC. What a marvelous Double Standard!! when an innocent patient gets hurt or even dies due to negligence of a doctor mostly all other doctors stands in que to support him blindly, get ready to provide him their false opinion, try to make excuses in favor of accused doctor and also try as much as possible to point out mistakes on patient\’s part to cover accused doctor…great medicos great…..keep it up u bastards!!! Why only black ribbon and candle light protest? It\’s Grevious Hurt (IPC 320) and should be held against the persons/authorities/officials responsible for \”NOT MAINTAINING THE NORM OF RESTRICTED RELATIVES WITH PATIENT\”. A healthy doctor has lost his eye and other functioning of the body. Who is responsible for all this? 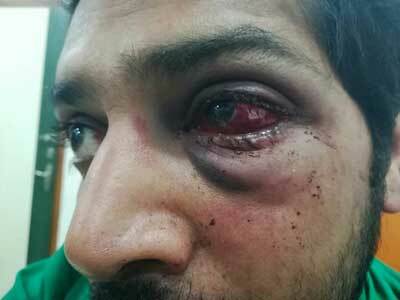 Those goons should definitely be punished but this will end the criminal and not the crime. We have got our right to protect ourselves though we are doctors .let\’s practice it. In a wrong system even the Right things likely to go wrong . There fore it is the combined responsibility of every one to correct the system, after all we are the part of this system. These are the problems of an unorganized system. With rapidly growing country like our still we are following age old system . To à / handle with dying / impending emergency conditions , we are badly in need of E M ( Emergency Medicine ) .Experts. These are the true saviors in such situations. EVEN though it is started as Specialty more than 30 years ago other parts of world , in our country it is HARDLY seen any of the Medical colleges across the country. That too with highest number Accidents in the world . More than 150000 productive age group individuals lose their lives ANNUALLY , Unfortunately these numbers are increasing day by day. That WHY I mentioned in the very beginning to find solutions to the problems , instead talking about the problems. When it comes buying useless materials the college Adminstration take KEEN interest. When it comes to taking PREVENTIVE measures like appointment Arm guards , police out post next to causality they show LEAST interest. On the other hand ,On the day 10 to 15 minutes Minister\’s visit , they cleanup entire premises and there are police force all around the campus . Why can\’t they take at least one tenth ( 1/ 10 th ) of the interest in providing the security . And just to guard the police station two gun men were posted around the clock , similarly just for an MLA or a DC they provide a police with a fully loaded automatic gun . Where as for a causality where 100s of patients with 1000s of deeply disturbed / upset / anxious about/ angry/ at times aggressive and violent crowds there no proper security ? ? ? . Let there be a law to post the Trained Arm Guards EITHER from police or from retired Defense personal. When we post an Arm guards to an A T M / At bank. Why at the sensitive rather supersensitive places like Hospitals, specially the Causality . What is reaction /response of College administrator, police and the District Administration? ? ? . It is the candle March by students that too in a day bright light or anything useful and productive discussion to STOP such incidents in future will remains a ? Mark.